Is the ‘Sixth Mass Extinction’ a genuine threat, or an overblown buzzword that distorts public debate about the state of the planet? Stewart Brand has recently weighed in on the latter side of the argument in an article in Aeon. He contends that “viewing every conservation issue through the lens of extinction threat is simplistic and usually irrelevant”. According to Brand, talk of mass extinction leads to the misdirection of public opinion and resources, and it may cultivate ‘panic and paralysis’. Is this a straightforward case of extinction denial, or does Brand have a point? Well, it’s a bit of both. I find much to agree with in his polemic against mainstream discourses of extinction. Frightening prognostications of mass extinction need to be tempered by balanced debate. That said, much of Brand’s argument is contradictory, misleading or simply too narrowly framed to reflect the scope and complexity of the issue. His intervention is certainly not outright denialism based on blind ideology and irrationalism (the kind we often witness amongst climate change deniers). Nonetheless, it makes some glaring assumptions that can distort debates just as thoroughly as the discourses at which it takes aim. Brand certainly has a point about this. There is a real risk that viewing all issues related to the biosphere in terms of worst-case scenarios can suppress creative thought and responsive action. This is precisely the goal of security entrepreneurs: to bypass political debate in order to ensure the swift and reactive implementation of ‘solutions’. In order to maintain nuanced, pluralistic engagement with issues that affect the planet, it is important to contest such approaches and to create spaces for innovative political action. As the second quote above suggests, this involves having a clear (but not over-stated) sense of one’s ability to cope with the challenges one faces. “Least concern’ is strange language. What it means is ‘doing fine’. It applies to most of the 76,000 species researched by the IUCN, most of the 1.5 million species so far discovered, and most of the estimated 4 million or so species yet to be discovered. In the medical analogy, labelling a healthy species as ‘least concern’ is like labelling every healthy person ‘not dead yet’. This is a fair point. The IUCN Red List categorizes its subjects in negative terms, framing their identity (and much of their value) as a function of their scarcity or proximity to non-existence. 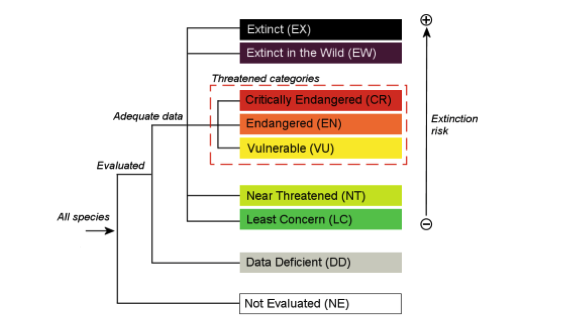 In visual terms, its rankings are colour-coded, moving from green to bright red to represent increasing levels of threat, and black to mark the ‘dead end’ of extinction. With this image, the IUCN draws on a common trope – the thermostat – that is instantly recognizable as an indicator used to communicate the risk of terrorist attacks (amongst other things). It is a textbook artefact of securitization: this symbol can prompt strong and immediate reactions amongst publics conditioned to associate it with urgent threats. In so doing, it can produce an overly-negative impression of the existing state of affairs. By drawing attention to these problems, Brand highlights the need to resist overly pessimistic, black-and-white accounts of extinction and mass extinction. In this, he is joined by Brad Evans and Julian Reid, who show how fears about extinction can be mobilized by powerful actors to engender submission to biopolitical forms of control. By treating extinction as a fait accompli, these power regimes preclude the possibility of other forms of politics – and life. In contrast, resisting subjugation to such regimes involves embracing inventiveness and the possibility of real novelty in the face of crisis. In a related sense, Brand points out that extinction isn’t all bad news for everyone. Instead of succumbing entirely to the processes of extinction, he contends, “Life becomes different, and it carries on”. In other words, extinction transforms ecosystems, but whether for the better or the worse depends largely on one’s perspective, interests and the context in which one is situated. Brand claims that the ‘inexorable’ direction of evolution is towards greater diversity. In so doing, he quotes some of the pioneering research by my colleague at the University of York, Chris D. Thomas. He refers to Thomas’ recent finding that climate change is driving not only decline, but also a ‘global acceleration of evolutionary rates’, including a marked increase in speciation by hybridization. Moreover, he cites the work of the conservation biologist Dov Sax, who has suggested that so-called ‘invasive species’ may actually be enriching ecosystems. This is a refreshing rejoinder to the dominant tone of xenophobia and speciesism that shapes most discussions of these jet-setting organisms (see this previous post).However, as we shall see shortly, Brand wants to argue from both sides of the debate about ‘invasive species’ – a few paragraphs later, he is cheering on their wholesale slaughter. The argument that extinction brings creativity along with destruction is an important tool for resisting the vice grip of securitization and maintaining a politics of possibility. By emphasizing the creativity of evolutionary processes, and the integral role of extinction in fuelling them, this kind of argument can engender openness to the potentialities of life. That is, instead of attempting to capture the biosphere in a freeze-frame, this kind of approach makes it possible to celebrate new and radically different life forms. This, in turn, can lead to an affirmative politics of solidarity transformation-with other life forms, as Rosi Braidotti has recently suggested. In addition, authors such as Elizabeth Grosz and Genese Sodikoff have shown that extinction is culturally productive and destructive. This is a prime example of difference-in-degree thinking. It suggests that all life forms that perform the same function are ultimately interchangeable, erasing the singular relations forged between particular species in specific times and places. In contrast, difference in kind refers to the irreducible, positive forms of difference embodied by unique multi-species communities. As Grosz argues, these differences cannot be quantified, but they are experienced by living beings. Differences in kind entail the singular relations that emerge between species within and across particular conjunctions of space and time. They are embodied in what Thom Van Dooren has called ‘flightways’: the unique multi-species histories that are usually classed as ‘species’. From this perspective, each flightway – and each extinction – is singular and cannot be replaced or compensated for. I would argue that this idea much better reflects the way that many human communities experience their relationships with nonhumans – as integral and irreplaceable. From this perspective, it is cold comfort to argue that a treasured species will be replaced by something new. Of course, such arguments can be used to support highly conservative, often nationalistic narratives in which particular species come to represent human groups. But they need not be taken to such extremes. My point is that it is important to embrace new differences, but this needs to be carefully balanced with a respect for the unique worlds that are destroyed with each extinction. As my comments above suggest, it’s a good idea to maintain an open and skeptical mind regarding statistics published about the possibility of a 6th Mass Extinction Event. The leading scientists studying the issue confirm that it is not currently possible to determine with any certainty whether it will happen. Brand labours this point, pointing out wide variances in reported rates of extinction (from 0.01 % to 1 % of species being lost per decade). He also quite logically points out that extrapolations from current rates assume their consistency across several centuries – and what are likely to be a very tumultuous few centuries for the planet. Only if this were to occur, he contends, “we might be at the beginning of a human-caused Sixth Mass Extinction”. However, the threshold at which many extinctions are declared a mass extinction is determined by the need for a functional definition; it is not an ontological fact. The ethical stakes of extinction do not hinge on whether 75% or 74% (or 3%) of currently existing species go extinct. Rather, they are rooted in the fact that many of the species with which humans have co-evolved are being eliminated, and largely due to alterable human action. No one, including Brand, seems to be disputing this point (in this sense, discussions of mass extinction differ from those of climate change). Despite Brand’s claims that extinction is localized (and it is, in part), it is also happening on a global scale, and matters to numerous communities in many different ways. Whether or not what is happening fits the biological definition of mass extinction does not change this situation. Furthermore in focusing on the exactitude of predictions, Brand seems to be throwing the precautionary principle to the wind. This principle, which is enshrined in the Convention on Biological Diversity (amongst other major international agreements) states that “Where there is a threat of significant reduction or loss of biological diversity, lack of full scientific certainty should not be used as a reason for postponing measures to avoid or minimize such a threat.” This certainly seems to be the case in relation to current patterns of extinction. It is important to ensure that this principle is not abused in such a way that it flouts scientific consensus and the public good. But it suggests that, given reasonable evidence that something momentous is happening in relation to extinction, it makes sense to think about various scenarios – from the best to the worst. This includes seriously contemplating the possibility of a mass extinction event, or at least a global surge in extinctions. The alternative is to risk being entirely unprepared – ethically and practically – for what might come. In one of the more impassioned sections of his essay, Brand insists that “Viewing every conservation issue through the lens of extinction threat…introduces an emotional charge that makes the problem seem cosmic and overwhelming rather than local and solvable.” First of all, what exactly is wrong with having an emotional reaction to extinction? As discussed above, the relations between Earthly life-forms are based on histories of violence and care, love and abjection, co-flourishing and exclusion – all of which produce, and are driven by, profound emotions. To view extinction (or indeed, any form of change that amounts to the severing of these relations) without emotion seems like an improbable scenario, and one that poorly reflects the relations between humans and other life forms. Second, I take Brand’s point that dealing with extinction may not be entirely beyond the scope of human efforts and ingenuity. But, whether they create changes for the ‘better’ or the ‘worse’ (and this, once again, based on positionality), the extinctions occurring now will reshape life on Earth. In short, these processes could alter the entire structure and conditions of life on this planet – and, as far as we know, the universe. Furthermore, the structures, conditions and relations between life forms are central to most, if not all human cosmologies. So, in order to understand what extinction means and what its stakes are across various multi-species communities, it is necessary to look to cosmologies. So, if anything, extinction is precisely a ‘cosmic’ matter. 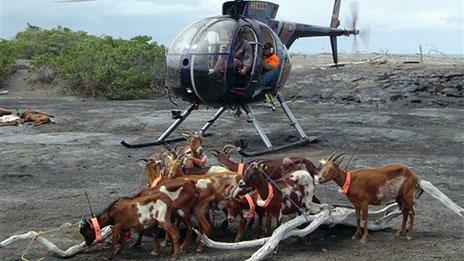 ‘Judas goats’ used on the Galapagos islands. Source: BBC News. eradicating unwanted life forms. For example, he discusses the efforts of some New Zealanders in the 1980s to destroy populations of rats in order to protect ‘native’ kakapos through ‘relentless poisoning and trapping’. In addition, he recounts the multi-year extermination project carried out with high-powered rifles, hunting dogs, helicopters and ‘Judas goats’ on the goats of the Galapagos. Brand also celebrates the fact that “More than 800 islands worldwide have now been cleansed of their worst extinction threat, with more coming [sic]. Some [eradication processes] are pretty spectacular”. And he enthusiastically greets new plans in New Zealand systematically to remove all cats, rats, goats and other species not deemed to be endemic to the island.For Brand, these stories are evidence of the ability of humans to ‘solve’ the ‘local’ problem of extinctions. In other words, such responses to the fear of extinction are deeply aggressive. They seek to protect loved or favoured life forms by destroying others. Of course, the animals to which Rose refers are endemic to Australia, but this does not change the logic of the act. Strategies of deliberate eradication erect subjectively-defined boundaries between those species that are deemed to be ‘native’ and ‘invasive’, relegating the latter to the ultimate form of exclusion from a community: death. What’s more, strategies of deliberate extirpation assign universal values to ‘native’ versus ‘exotic’ life-forms that might vary substantially across different multi-species communities. An interesting example of this can be found in Sodikoff’s work on conservation in Eastern Madagascar. She recounts how international conservation plans intended to remove ‘invasive’ species such as feral boars and skinks. These projects undercut existing systems of Malgasy fady (ancestral taboos) that ensure relations of respect and restraint between species, including these ‘invaders’. Although technically not ‘native’ to Madagscar, the life forms in question had become entwined with human communities and enfolded in their ethical systems. To destroy them was, in this case, to commit a major ethical breach. This example shows that it is highly problematic to assume that eradication is a ‘good’ thing except from an extremely narrow and exclusionary conception of ethics. Finally, much of Brand’s argument hinges on the assumption that technological development can transcend whatever conditions and problems emerge from existing patterns of extinction. He is particularly excited about the possibility of ‘precision conservation’ techniques based on minimalist tweaking of wildlife gene pools’ that could enable ‘applied evolutionary biology’. Moreover, Brand is probably best known today for championing projects of de-extinction. Indeed, researchers at his Long Now Foundation are working to re-create the extinct passenger pigeon, and, in the article, Brand writes with admiration about projects such as the Pleistocene Park. The core of his argument is that “With every increment of improvement in scientific tools, data and theory, and every single project expanding the breadth of conservation practice, we learn more about nature’s genius, and we increase humanity’s ability to blend in with nature, to the everlasting benefit of both” This statement is delivered with very little qualification or definition of what this ‘everlasting benefit’ might be. It expresses a variety of techno-optimism founded in faith in technological change, which tends to bypass nuanced discussion of its implications and limitations. I would argue that this approach is just as misleading as the unproductive nihilism of the mass-extinction-mongers. What’s more, it is just as deeply rooted in the mobilization of emotion that Brand wants to condemn. It’s important to be critical about any claims to certainty, whether nihilistic or optimistic in nature. In this sense, Brand’s article helpfully calls out simplistically pessimistic predictions of mass extinction invoked for their shock value. But it does not argue or explain away the very real, multiple ethical and practical challenges raised by the patterns of extinction that are transforming the planet. In fact, it swings too far to the other side, creating a binary between these two poles. Instead, what is needed are nuanced discussions of extinction that reflect its multiple meanings, the variety of experiences it engenders, and the (sometimes irresolvable) ambivalence of the creative/destructive change it brings. This entry was posted on Wednesday, April 22nd, 2015 at 7:21 pm	and tagged with 6th Mass Extinction, animal studies, apocalypticism, climate change, cosmology, De-extinction, Endangered species, invasive species, IUCN Red List, Stewart Brand and posted in animals, anthropocene, ecology, global ethics, plurality. You can follow any responses to this entry through the RSS 2.0 feed.